My book club met last night to discuss Hisham Matar’s In the Country of Men. This book is about a young boy growing up in Tripoli, Libya with a father who may or may not be involved in anti government conducts and a mother who may or may not be visiting the baker for smuggled alcohol to hide her depression. With no structure at home, our protagonist relays on those around him as he witnesses the horrors of growing up with a murderous dictator. For me the writing fell short of other Arab novels I’ve read, however as a debut novel it does an excellent job of describing Tripoli under the terrors of the Gaddafi rule. It was even shortlisted for the 2006 Man Booker Prize. Matar went on to write Anatomy of a Disappearance, and in my opinion that is a much better read. I had a personal connection to this book since I distinctly remember my father telling me the story of Hisham Mater’s father’s real life disappearance in 1990. At the time, Libyans abroad thought that Egypt was safe to travel and met family there that they were not able to see otherwise. They soon learned that Gaddafi had a detrimental reach over the border. Abu Salim prison massacre. I was happy to recently read that may not have been the case. The true story of what happened may someday be told. In our book club the host provides the main dish and everyone else brings the sides. Since our book was about my birth country, I decided to try my hand at making a common dish in Libyan cuisine: shashouka. To be honest, I had forgotten about shashuka, since I hadn’t eaten it in years and years. It’s not a common dish here in America because it’s made with Libyan gedeed, قديد ليبي, which is hard to find. If you do decide to try your hand at it, it takes a very long time to make. of meat hanging from lines all over town. Last week I was trying to decide what to make for book club on a day that I knew was going to be full of parent teacher conferences and multiple auto car repair shop visits. I needed something fast and well, Libyan food is not known for being fast. Someone in one of the blooger groups I belong to mentioned shakshouka and posted a recipe. Soon others mentioned that they ate it in Tunisia, Turkey, Saudi Arabia and even Israel. 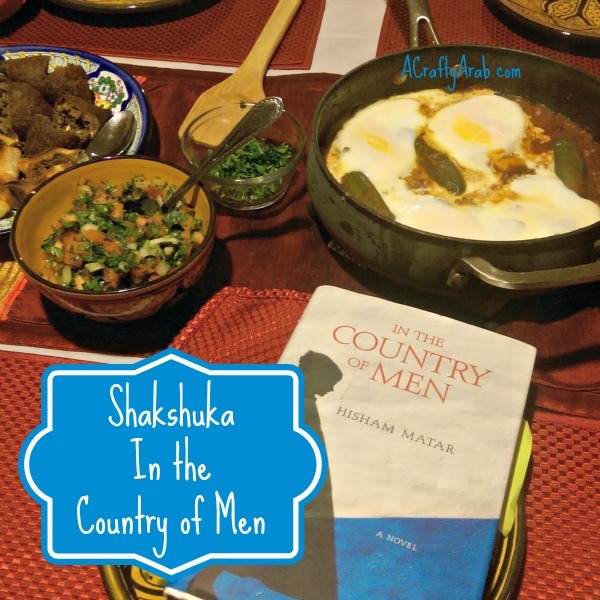 When I looked into the history of shakshuka, I found out that it originated in North Africa, with wiki saying it is part of Tunisian, Libyan, Algerian, Moroccan, and Egyptian cuisine. Also, if you are to eat Doktor Shakshuka, in old Jaffa, you are eating at an establishment owned by a large Libyan family, who most likely migrated to Israel from 1948 to 1951. She gave me her recipe for Libyan shakshouka and I decided to make it last night for book club. We spent our evening talking about the history of Libya and we answering questions together about the book. Since I had no way of getting access to gedeed, she said I could use beef jerky instead. It actually tasted quite yummy and the pan was empty by the end of the evening. Saha’a (to your health!) if you would like to try it. 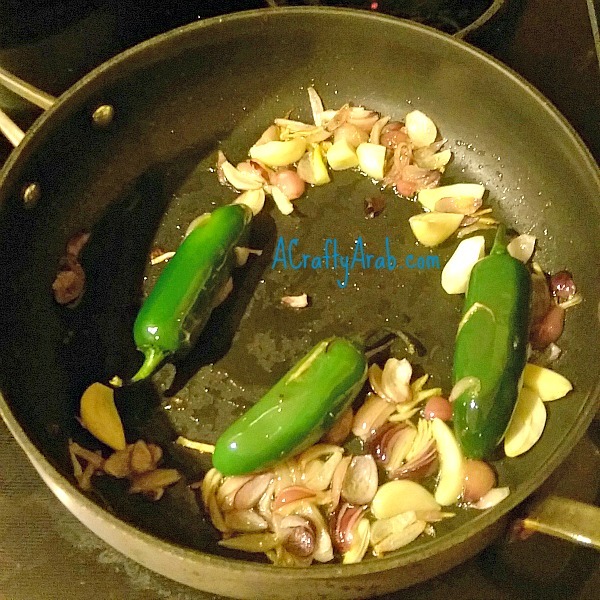 In a deep pan, heat up the olive oil, garlic, onions and jalapenos. I put them in whole because I didn’t have time to seed them. It gives the dish the flavor, but let my guests be in charge of how spicy. 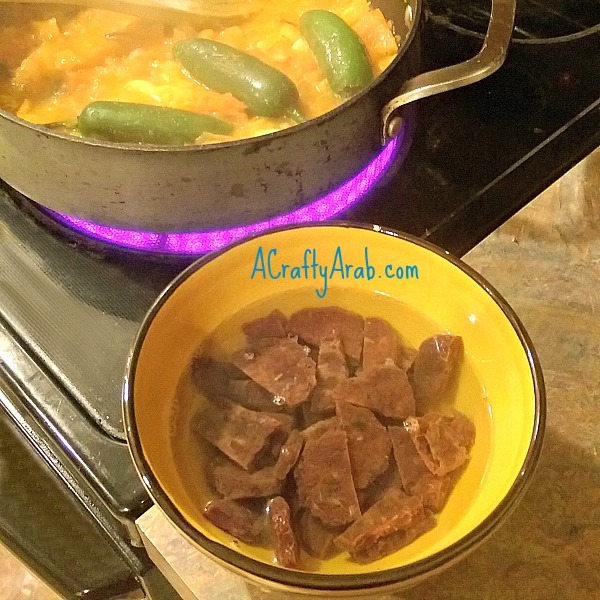 While the stuff is happening on the stove, I used kitchen scissors to cut the beef jerky into small bite size pieces and soaked them in water. 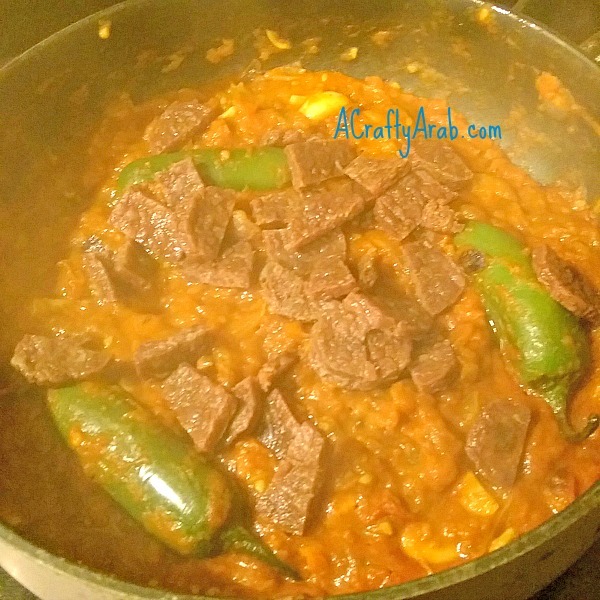 This helped soften the jerky as gedeed is not “tough” in the original Libyan dish. 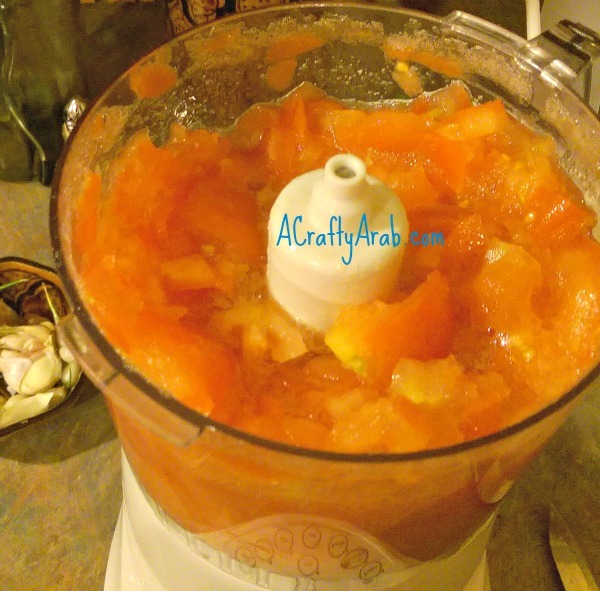 While that is soaking, I pureed the tomatoes in a blender. 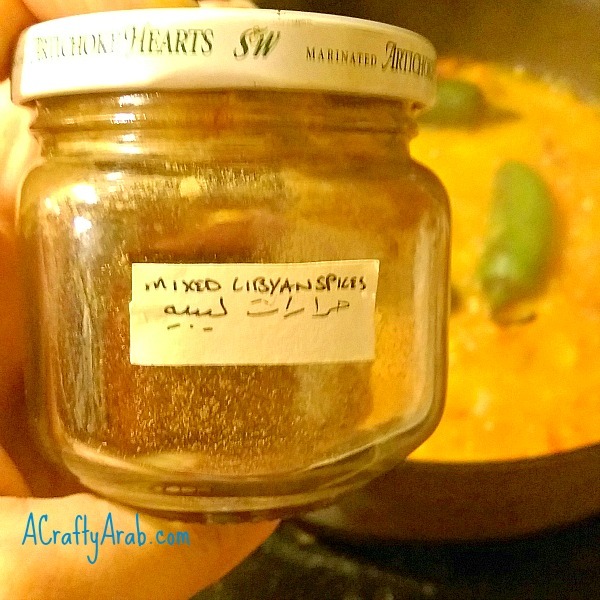 I’m lucky in that I have an Arab mom that stocks my kitchen with jars that simply say Libyan spices. It’s our country’s version of allspice, but way better. If you don’t have a Libyan mom stocking your spice rack, simply mix 1 tbs turmeric, 1 tbs ground cinnamon in your pan. minutes on high, then turned low to simmer and mixed in one heaping Tbsp on tomato paste. Be generous, it’s okay. I let this simmer for 20 minutes and came back with four eggs. I cracked them on top, making sure to break the yoke. I put a lid over the eggs and set the timer. 5 minutes for runny centers and 10 minutes for hard centers. I left the lid on untill you got to the table and then add a handful of parsley for color immediately before serving. Shakshuka is not eaten with utensils, rather warm bread is used to soak up the sauce, eggs and meat. 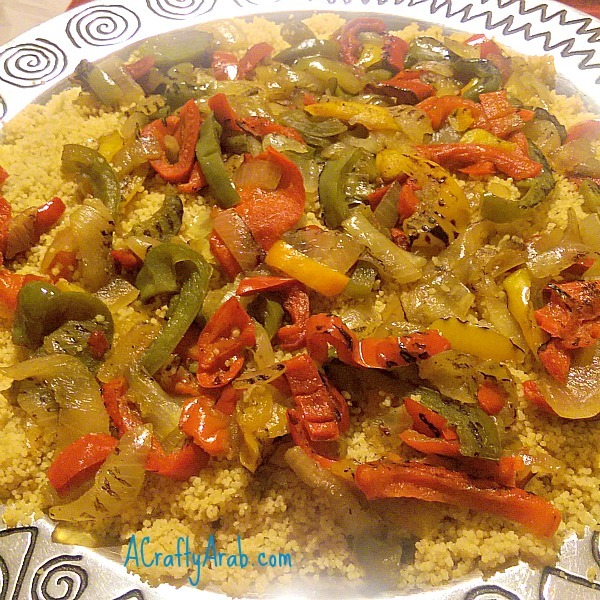 We also enjoyed sides of couscous and vegetables. 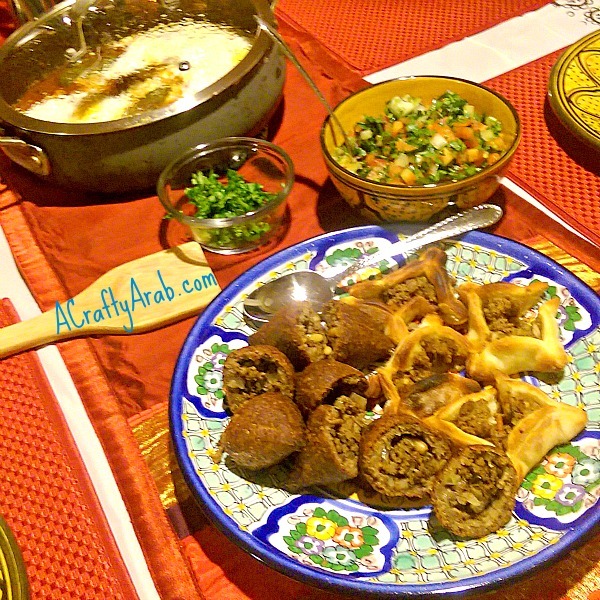 Along with taboulah, kibbeh and sfiha from the local Lebanese market in town. After dinner we went to the living room for tea, halwa and yummy homemade fruit cake and cookies. It was a lovely night and I can’t wait till we meet again next month. 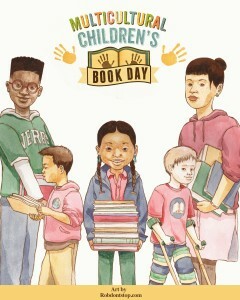 Today is Multicultural Book Day and there are over 200 bloggers participating worldwide. The mission of today is to not only bring raise awareness for the kid’s books that celebrate diversity, but to get more of these of books into classrooms and libraries. Check out the hashtage #ReadYourWorld on Instagram and Twitter to read some fantastic reviews of diverse children’s books. I only heard about this day last week while researching an upcoming book list so I was not able to participate. 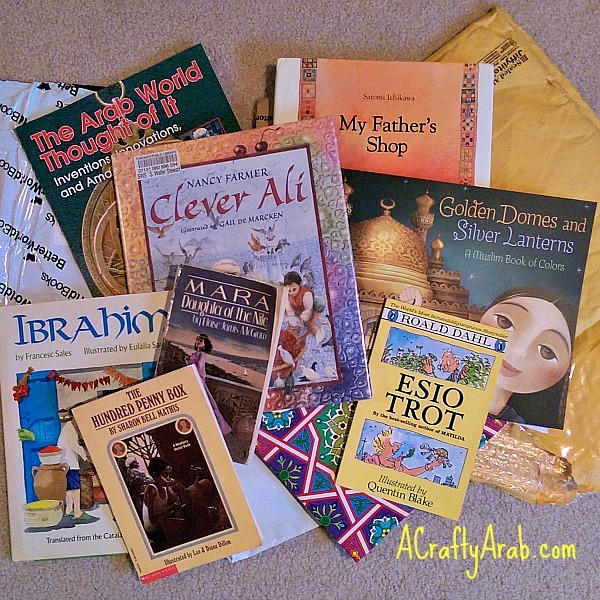 But next year you should expect to see a review of some of these Arab books I got in the mail this week added to the mix! My daughter has parent teacher conferences, so she gets out of school for three days early this week. Since there are short days for a lot of schoolwork, her teacher and I decided to put our birch tree art project on hold. However, not having art at school doesn’t mean that we can’t have art at home! 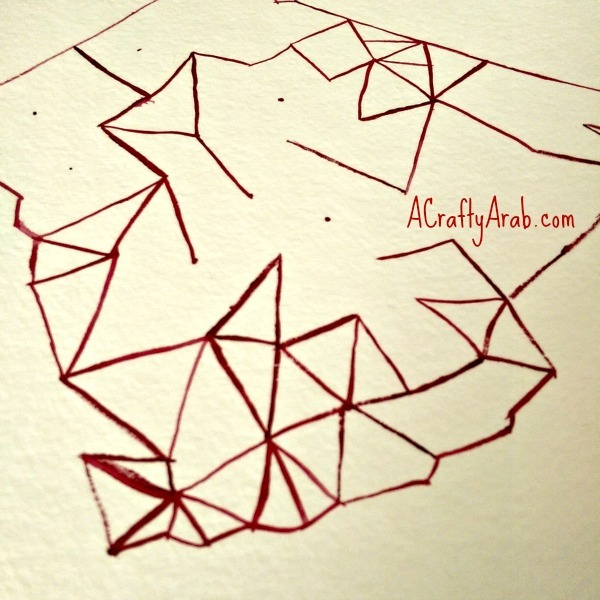 I pulled out the watercolors and we spent our afternoon learning how to make a geometric painting of Algeria. Algeria (Arabic: الجزائر‎ al-Jazā’ir; Berber: ⵍⵣⵣⴰⵢⴻⵔ Dzayer), officially People’s Democratic Republic of Algeria, is a country in North Africa on the Mediterranean coast. Its capital and most populous city is Algiers, located in the country’s far north. With an area of 2,381,741 square kilometres (919,595 sq mi), Algeria is the tenth-largest country in the world, and the largest in Africa and the Arab world. Algeria is bordered to the northeast by Tunisia, to the east by Libya, to the west by Morocco, to the southwest by Western Sahara, Mauritania, and Mali, to the southeast by Niger, and to the north by the Mediterranean Sea. The country is a semi-presidential republic consisting of 48 provinces and 1,541 communes. Abdelaziz Bouteflika has been President since 1999. 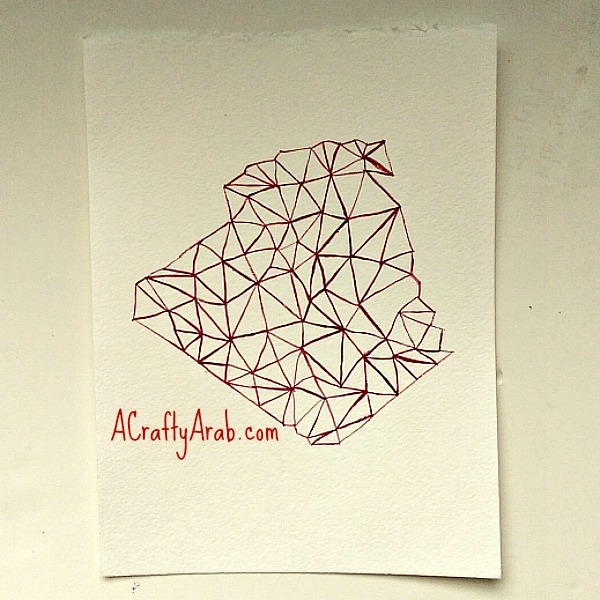 I’m sharing our tutorial so you can try to make an Algerian geometric watercolor painting also. 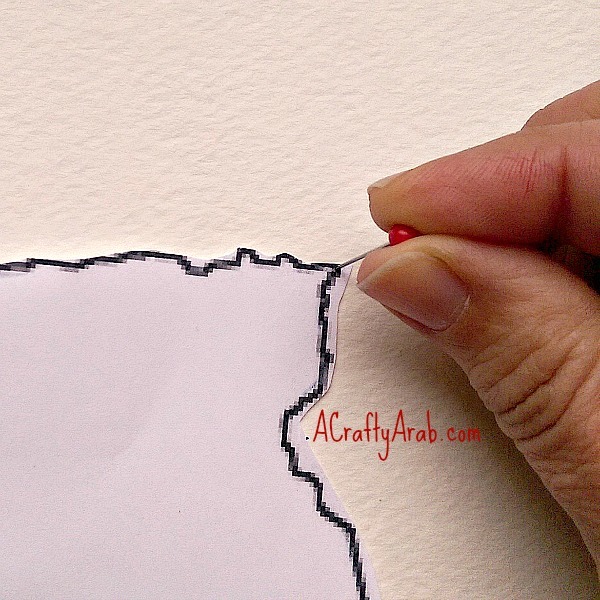 Start by cuting out the outline of the Algerian map but don’t worry about the little coastal details. 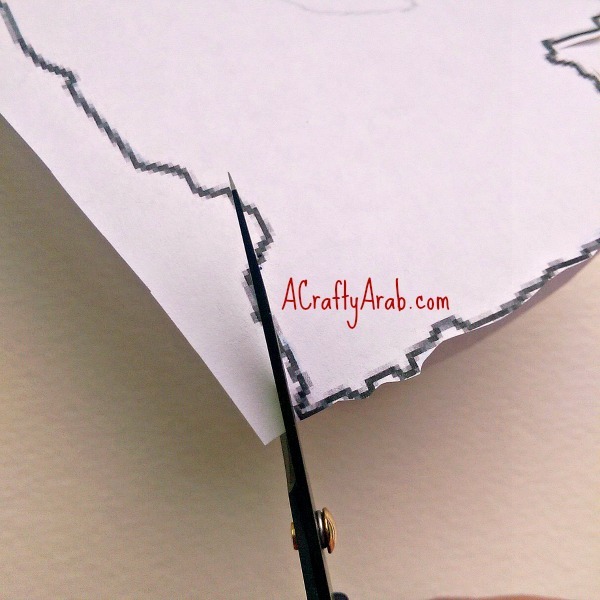 Place your cutting mat under your watercolor paper. Add the map on top and use your pin to mark out the outline. Add a few more random holes in the middle of the country also. Start connecting the holes to each other, forming triangles as you go. Keep connecting the dots, adding more as needed. 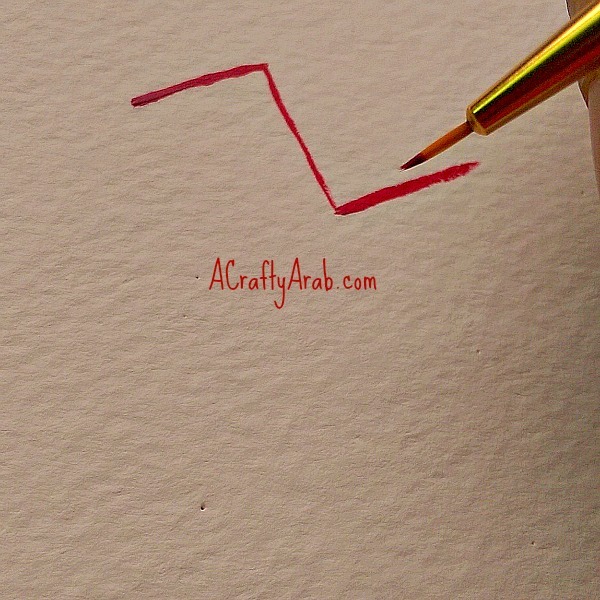 Turn your paper around to see different holes or add dots with your paintbrush as you paint. Keep going until your Algeria is connected. Lay flat to dry and it should be ready to frame in just a few hours. We have decided to keep going and see what other countries we can find on the internet to print out! 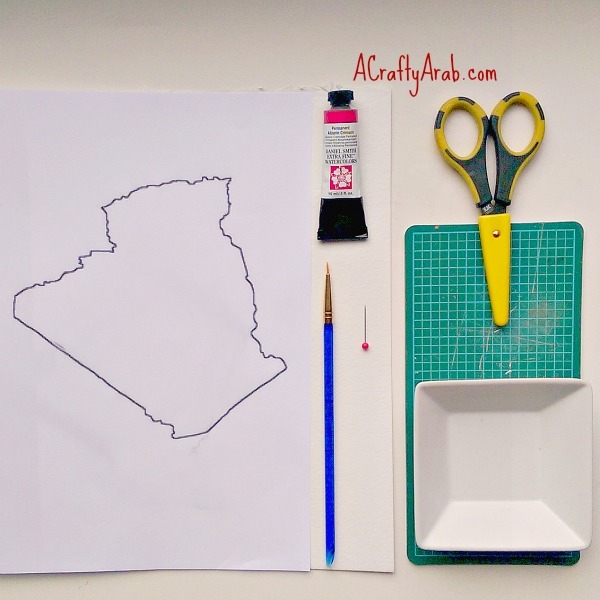 To see more crafts from the Arab world, visit A Crafty Arab’s Arab League Crafts and Tutorials Pinterest board.